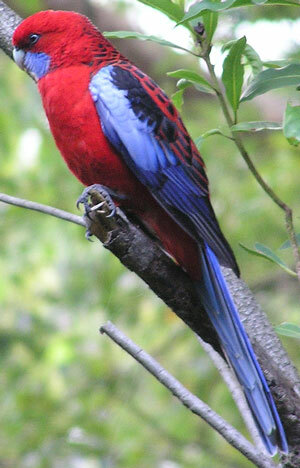 The Crimson Rosella (Platycercus elegans) can be found in New South Wales, Victoria and South Australia in open forest areas. It has a melodic and distinctive piping call. Apparently parrots are left handed - as the image at the very top shows. The juvenile Crimson Rosella has light green instead of crimson on its back. A close cousin, the Green Rosella (Platycercus caledonicus), is very similar to the Yellow Rosella, except it has green instead of yellow on its back. 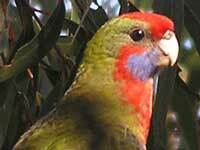 The Green Rosella is only found in Tasmania and Bass Strait islands. It is easy to imagine that the Yellow Rosella can be transformed into Crimson Rosella by replacing the yellow with crimson. 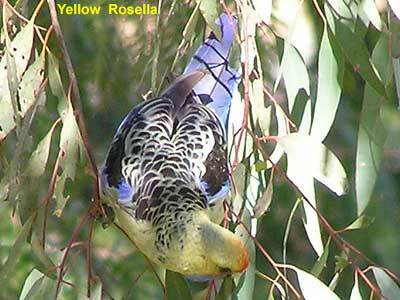 The Yellow Rosella (Race flaveolus) is found along the waterways of inland NSW. 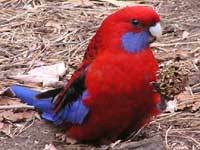 Whereas the primary Crimson Rosella (Race elegans) is found along the NSW and Victoria coast and adjacent mountain ranges. 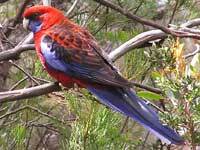 The Adelaide Rosella is found around Adelaide and to its immediate north and south. The photo of the Yellow Rosella was taken in Wirrabara in the lower Flinders Ranges of South Australia on the western edge of its range. 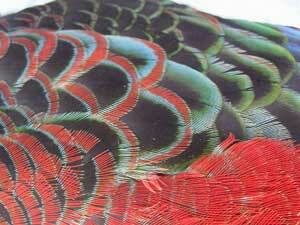 The wonders of feathers - especially their intricate design and colours. How does each barb of a feather know to be a certain length and to change colour at a certain point so as to create the pattern shown? 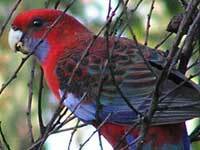 All the Crimson Rosella photos were taken in Cheltenham in Sydney and in Leura in the Blue Mountains. 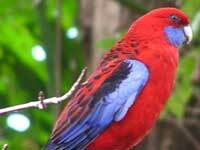 Here's some additional Crimson Rosella images.